We have reached the last days of Spring. 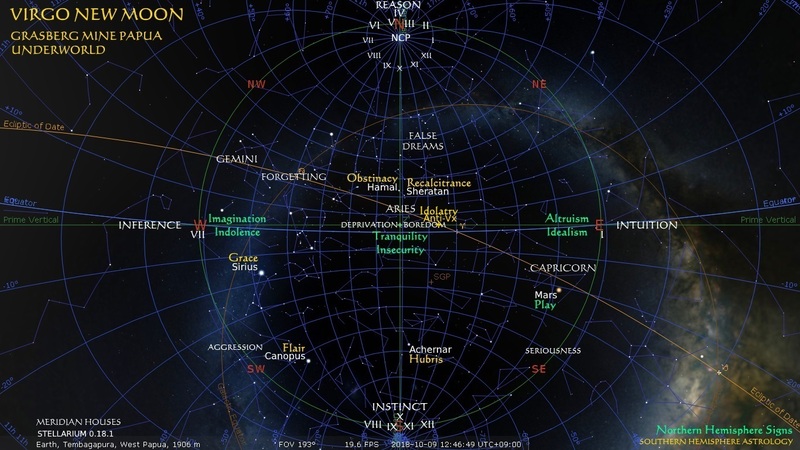 Tomorrow, the Sun will enter Libra in the Breamlea Zodiac, the Once A Jolly Swagman Sign which in its quintessential Australian way portends a Northern copper’s boot for the Centaur’s indiscretion of killing a Lupine sheep. Springtime has calmed down, accepted the limits of possibility in the habits and rules of co-existence, internalized the consequences of experiment and choice in a crowded world, and verges on Summer (on November 8 with the nightfall transit of Fomalhaut, the star of affirmation). Shall we be friends, me and you, South and North, East and West? Can ‘country‘ integrate conscious and unconscious, the shared meanings of language and the personal meaning of poetry and music yet unsung? How rich must language be to nourish us with reverence for ancestors whose customs have departed with them, made invisible to us by ours? What can the loneliness and nostalgia for village of our foreign neighbour teach us about ours, forgotten in a similar experience buried in different words? We all carry the burden of our parents, but must we paper over it, and can we not honour them with our innovation and compromise? We must revitalize the invisible, and populate ‘country’ with mystery, ignorance and imagination, lest indifference overwhelm curiosity, and the black and white facts that we pass down to our children and our children’s children be dead ones, no more than the bare bones of a meagre vocabulary. Hard to imagine, but the diameter of this horizon is only fifty kilometres on the ground, yet above it is half the universe. By the attributes invested in them by me, I know that the stars beyond the circle of daylight, if you rewrap the two-dimensional projection, are being gazed at by some Other in the Shanghai night who knows them by different names and attributes, in another language as timeless as mine, which tens of millions who do not even remember the stars are there are losing. Friendship is defined in many ways, notably by the contributors to the Urban Dictionary, but I think the best definition of ‘friend’ is someone who ‘improves’ you, makes you feel kind–all kinds of kind are of a kind, kind of–and only incidentally someone who is kind to you. Not even your lover is your friend unless he or she fills you with kindness. Kindness is not charity. Rather than expecting something from a benefactor which never comes in adequate measure, we wait expectantly on our friends, so that we can lavish our attention on them, and discover more of who we are under their attention. There, not in identity-with, nor in identity-from, our true nature creates itself. “In every waking moment, your brain uses past experience, organized as concepts, to guide your actions and give your sensations meaning. When the concepts involved are emotion concepts, your brain constructs instances of emotion.” Lisa Feldman Barrett. It is the primordial Mystery: Connection is my innermost Being. Community is made out of friendship, friendship out of emotion and emotion out of language; language is made out of emotion, emotion out of friendship and friendship out of community. This is what I believe gives power to the notions of ‘significant Other’ and ‘love of one’s life’ constellated by the Vertex: the ‘Over There’ feels like it is the ‘In Here’. Can a reason be imagined why the ‘In Here’ would repudiate its ‘In Here-ness’ ‘Over There’, other than a fundamentally disconnected and erroneous understanding of language made identity-fetish? I implore you to interrogate, not forget, the language of the past. Before you tear down the monuments to the depravity of your ancestors, try to find the old words which masked separation and deprivation in the culture in which your great-grandparents were raised, and which were filtered by the emotions of your grandparents and in turn your parents and you. Before you remove the ruthless conquest of your indigenous people from your sight, remember that they whose memory shames you are of your spirit, your love, your kindness, your disappointment and your bitterness. There are words for the courage and dogged determination to survive in the middle of nowhere, and they are just as endangered as the language embedded in indigenous country. Befriend them. 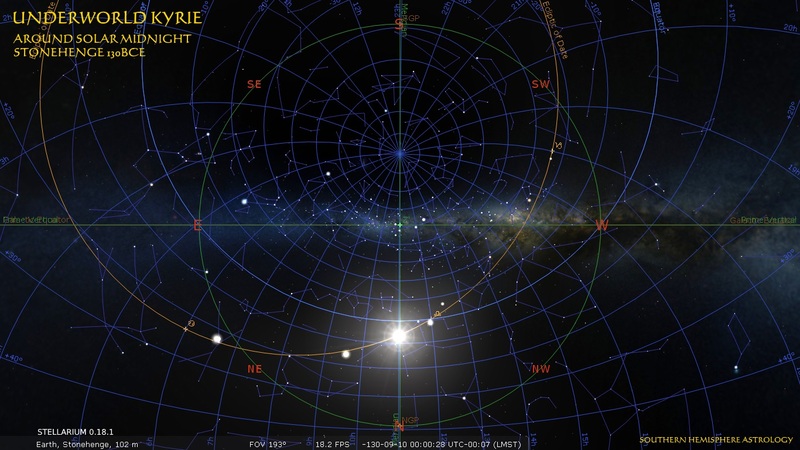 In this chart the official New Moon, when the two bodies have the same ecliptic longitude, is plainly exhibited at the moment the descending Sun is due west in São Paulo, because the Summer Solstice Point is crossing the Meridian, and São Paulo lies on the Tropic of Capricorn. The Sun’s path to the horizon is its line of declination on the equatorial grid presented, whose hour circles reveal that the Moon is already 1.5° past it. For reasons of symmetry with the stars and cardinal directions, I project the Breamlea Zodiac cusps by hour circles, and logically, the Moon is already in Libra, since the Sun is less than a degree from it. What beguiles me, however, is what is happening to the Vertex as the Ecliptic and Prime Vertical align. A midwife needs a ludicrously accurate time-piece in the tropics! In less than three minutes, the Vertex moves through five constellations. What tempestuous yearnings lurk in the tropical heart, if the Electric Axis really has any meaning. If dream lover and attachment style are just habits, they can be admired for their alacrity in the few seconds a day they enjoy for their reinforcement! Religious scholars have been tabulating kindness for thousands of years, and making a decent living out of it, so it is no wonder that the primal, connective, responsive instinct of kindness has been institutionalized as charity, and that we have come to confuse friendship with ‘being there’ for someone. No matter, teaching your children to be righteous by obeying rules of justice and charity cultivates their attention, the conduit which affords intelligence of instinct, and instinct of intelligence. Attention alerts them to the quality of their friends as attentive friendship informs them of their own qualities. Bit by bit, their internal vocabulary expands to differentiate friend from fellow, benefactor from pauper, lover from frenemy, sharer from user. Your lights douse the night while you watch Survivor. How should I feel? Your exiled ancestors on the Friendship lie in enmity. How should I feel? You breathe in greed and your denial turns off my fan. How should I feel? Your mystery is love, and you diagnose it on the spectrum. How should I feel? My truest friend is the horizon circle I intersect with the horizontal one, and the blurry fringe of eyelashes which frame it and keep it clean, beat, beat, beating my era, keeping me present, grounding me in the sky. I call my imaginary friend, ‘Country Member’. A Tasmanian, he laughs. He knows I can, with occasional help. We grew up together. How do you feel? 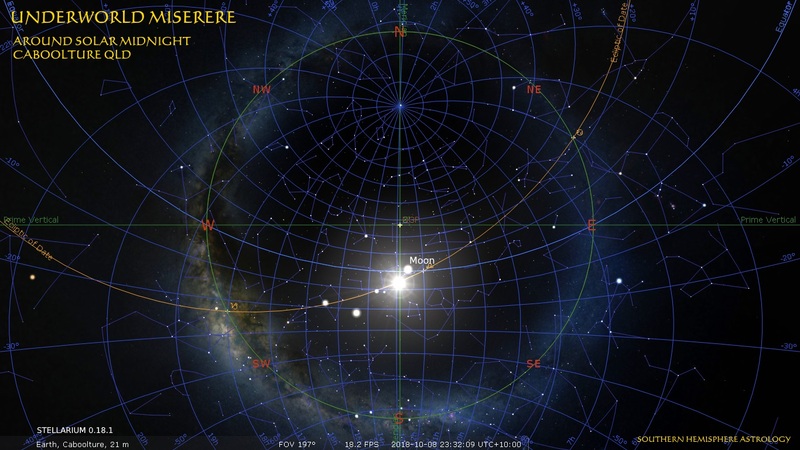 Ostensibly, the conjunction of Sun and Moon in sidereal Virgo signals a debate about community, since we are venturing out into a busy springtime period of competing agendas. In contemporary usage, ‘community’ means a group of people who share an identity, and Southern Hemisphere Astrology would agree with this usage. However, I seem to stand alone as regards the meaning of ‘identity’. Identity is not a characteristic. It cannot be defined, decided or owned, since it is not fixed, but always becoming in a feedback loop engaging waking consciousness with deeper subconscious levels of awareness and meaning. My generation, at least to some extent raised among religious precepts, link ‘identity’, and logically ‘community’, with aspiration and dream, not with character or personal history. They simply do not understand how anyone can actually believe in communities formed from definable static identities, as compared with their participation in communities articulating a shared vision or commitment. Young secular progressives on the other hand seem unable to understand “We are all one” to mean anything inclusive outside their group. I submit that two perplexities are at the root of this divide. One, a loss of historical perspective, a dissolution of time and causality into the now; and two, a hyper-inflation of waking consciousness and personal space at the expense of a subconscious reality of dreaming, ancestral voices, and vocation. An identity framed and maintained as a real entity by waking consciousness is like Sisyphus doomed never to get what he is pushing to the top of the hill. What this identity is pushing is community. The force of gravity is lent by opposing groups with profoundly other instantaneous perceptions. Ultimately, identity politics will discover that unity in shared grievance has only one imperative, warfare between grievances to create ever more grievance, and implies only one community, a community of one. Identity used to subsume difference, because change, alternative means to an end and ambiguity of relation were assumed. Difference was an accident, and community a coincidence. Somewhere along the line, secular societies, without even realizing they had thrown a precious baby out with the bath water of religious participation, began to really believe in universal human rights as though they existed separately from universal human obligations, and before you could say, “Hey, Presto!” there was a world full of victims equating identity and pain-body, focussed on the identity of both those to blame and of any heretic with the balls to say,”I’m not hurting that bad”; and suddenly, the biggest crime was to inhibit someone’s healing. This world is just fiction, ladies and gentlemen–Hollywood, Bollywood, love, fear and everything in between–and the most important element of it is making it real. Performance, and performance there must be, is real to its audience, the silent ones beyond the footlights who know it’s a role you’re playing for their sake, and who love you for it. Sit in the audience. Recognize fellow-players when you see them. That is community: you cannot sit twice in the same one. Nobody owns his space, ladies and gentlemen, and no amount of proselytism and appropriation-resistance will alter the fact that personal reality is fiction. Sharing is messy, and judgment and exploitation are perhaps built into it, and degrees of success in marketing, that is to say, comparative numbers in ashrams, churches and mosques, or in social forums on the net, but that’s the nature of self: it’s designed to be expressed, not hoarded but shared. You cannot wake twice into the same identity. When it all boils down, community may be nothing but the kindness of the audience, suspended disbelief. How can you be what you’re becoming? Perhaps kindness is the way society dreams. What the so-called ultra-right represents may be no more than slighted generosity, and we should hear the underpinnings of their utterances in that way, because we need their kindness. The North is a story, the location of mythology, the inching across the night sky of the primordial artefact known as the Zodiac. The South on the other hand, defying narrative, simply revolves. 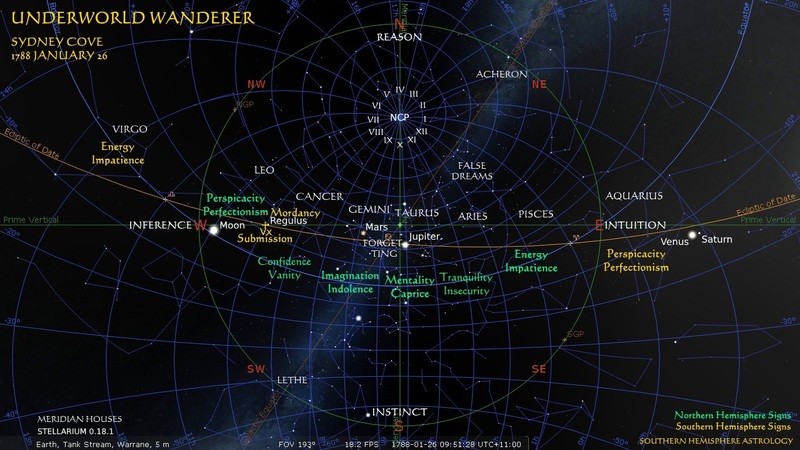 Reverse directions if you’re in the Northern Hemisphere, but my astrological focus is on Southern Hemisphere experience, because nobody else’s is. It is by no means paradoxical that the most important attribute of the North is that it is opposite the South. 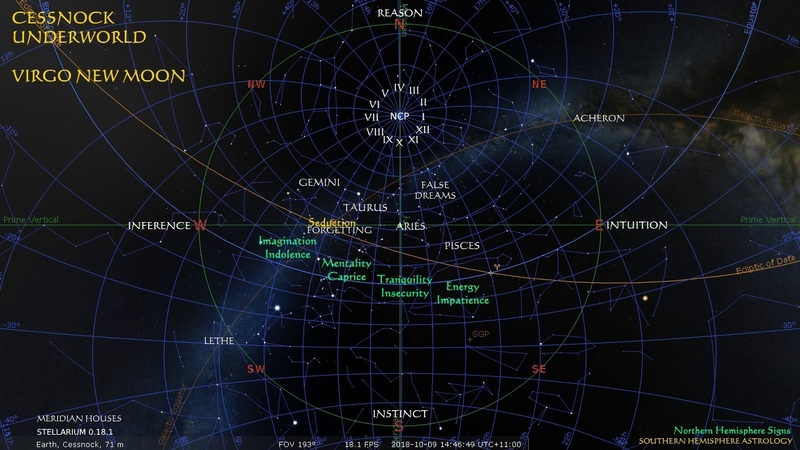 Astrology is a system of symbols of human existence, and the upper (northern) Meridian, or Medium Coeli, where the stars, and approximately, the Sun, Moon and planets, culminate in their daily arcs, is given pride of place as the symbol of the conscious self. However, there is in each of us an awareness of the limitations of that waking, egoistic consciousness, which works in our body-consciousness as under-arching and over-riding necessities like eating and sleeping, and, I would argue, in our dream-consciousness as moral, spiritual or metaphysical questions, such as, “Am I responsible for what I’ve just done?” All of that deeper dimension of consciousness, and therefore any possibility of individuation, wholeness, or oneness, is symbolized by the Meridian, the direct, continuous connection of above and below, North and South.